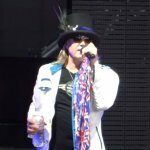 Def Leppard and KISS continued the Summer Tour 2014 last night in Sacramento, CA with another unchanged 14 song set played. KISS opened with 'Psycho Circus' which returned to the set in place of 'King Of The Night Time World'. They also replaced 'Let Me Go, Rock 'N' Roll' with 'Cold Gin'. The next show takes place on 5th July in Irvine, CA. A home town show for Phil Collen.